India is one of the fastest growing economy in the world. It has in fact reached a growth of 7.5% during the period January-March of 2015 as compared to China’s 7%. This has by far been quite impressive considering the economic slowdown globally over the last couple of years and the lack of adequate financial reforms by the Central Government. In fact the growth of India’s economy has recovered marginally from the previous year. Still it is the 7th largest economy in the world with an estimated GDP of 2.28 trillion USD (International Monetary Fund 2016). Projections by international institutions (CID, Harvard University) show that India will continue to sustain its economic growth over the next couple of decades keeping the 7% mark. This is contrary to the continued slowdown of China pegged at 4.3%. It has been projected (PWC 2016) that by 2050 India will be the second largest economy in the world after China, overtaking even the US. Thus India has the greatest potential of becoming the emerging market to the leading economies of the world. This sustenance of growth will be mainly due to the emerging youth population of India. All of them will not be employed, but engage in self-employment through creation of small and micro enterprises. Their employment will ensure greater share of revenues to the Government in the form of taxes and other social exchanges building the blocks of countries growth. Most of the economic growth in India will be in the services and the manufacturing sector. The other sectors of importance will be the mining and quarrying, electricity, gas and water supply, construction, transport. Importantly the growth of the agricultural sector (the largest contributor to Indian economy) will be stagnant with no sign of rapid acceleration. This will be sustained due to the recent policies of the Government launching the “Make in India” campaign to promote India as the most important and emerging hub for manufacturing. Whereas the economic growth signs are positive riding on the manufacturing sector, questions arise on the issue of raw material availability for driving the growth. The major and critical raw materials to cater to the manufacture and infrastructure growth are steel, coal, cement, sand and aggregates to name a few. To fuel the growth of the country one of the major raw material is coal. This is used as a basic raw material for power generation and also for producing steel, cement and other processed goods. Reports have predicted that India has enough coal to last for centuries. However reports by TERI suggests that with current rates of consumption we have enough coal and lignite to last for 140 years. However if the country has to sustain the projected economic growth rate then the total extractable coal reserves will last only 45 years. India ranks sixth in the world on the reserves of iron ore next to Australia, Russia China, United States and Brazil having a projected reserve of 8,100 million metric tons. However the future looks quite bleak with estimated life of the total reserve at 20-25 years (considering the increased rate of economic growth). This might be extended in the future with emphasis on import of high grade ore from neighbouring countries. Limestone is one of the major raw materials for producing cement, quicklime and other building materials. It is one of the most abundant mineral in the earth across countries and geographies. However it is also one of the most abundantly mined mineral in the earth. Majority of the limestone is used in cement manufacturing. Although India has quite a substantial reserve of limestone (cement grade resource at 124 billion tonnes) however the processing of limestone to cement raises issues of direct CO2 emissions to the environment. This requires a paradigm shift from the usual nature of doing business or production by standard processes and techniques. Whereas the business profits and goals needs to be kept in mind, the issues of environmental degradation and resource availability is of prime concern. This is applicable for any businesses looking at the long term goals, profitability and sustainability. Development Alternatives has been working for the last three decades on developing technologies which minimizes the use of virgin natural resources and also are less polluting reducing the use of energy. This has been made possible through the use of industrial and process waste materials and their value addition to realize improved profits through reuse and recycling. Four recently developed technologies are worth mentioning here to provide an example to large, medium and small enterprises in defining new ways of doing business without degrading the environment and increasing the life of the natural materials we have. This technology has been developed to use the waste foundry slag and casting sand in producing comparable quality PCC based building materials. The waste foundry slag is crushed in required aggregate sizes and used to replaced natural stone aggregates to produce building materials e.g. paving blocks, kerb stones etc. Research is also on-going to use the foundry slag in specialized application as an additive to concrete. A couple of enterprises set up has also demonstrated the financial viability of these enterprises. 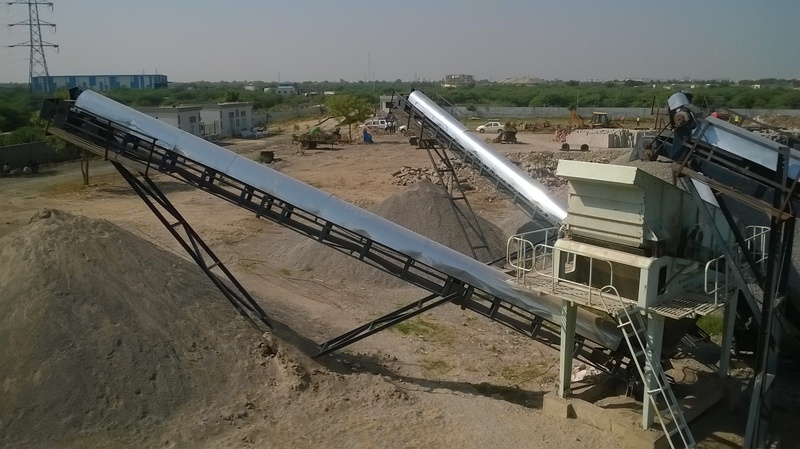 The state of Rajasthan alone produces around 7 million tonnes of marble sludge waste per year. Most of these waste is concentrated in a couple of districts creating enormous environmental pollution especially in the summer months. Based on the research and development carried out at Development Alternatives, it has been found out that the waste marble sludge can be an important raw material for making normal paper. The marble sludge has the right particle size and whiteness for producing a quality paper or any GSM. Alternatively the marble sludge can be used in as a valuable raw material to replace virgin top-soil in making fired clay bricks. It can also be an important raw materials for making ternary blended cements. Support is needed from the State Government and agencies to demonstrate these technologies in a commercial scale. Recent studies show that India produces around 716 million tonnes of construction and demolition waste per year. Presently all of these waste are either going to landfills or unauthorizedly dumped in rivers and lakes to reclaim lands for construction. Products has been developed in utilizing processed C&D waste in developing PCC based products. Emphasis has been placed on using then in building materials since these are prime areas of bulk use. On-site tests of performance and durability are being carried out to determine the usage in RCC also. For every 20 tons of CO2 that enter the atmosphere due to human activity, one comes from the kilns of cement factories. It is a paradox: concrete is one of the construction materials with the lowest environmental impact known to man, yet the sheer quantity of produced worldwide puts it among the top contributors of human CO2 emissions. How can current resources meet the projected increasing demand? How can the environmental impact (CO2 emissions) of this production increase be mitigated? The majority (60%) of CO2 emissions associated with classical cement production come from the decarbonation of limestone (“chemical” CO2) during the production of clinker – the main ingredient of cement. The most effective strategies to reduce environmental impact lie in reducing the clinker content of cement. The Limestone Calcined Clay Cement (LC3) developed looks at the synergetic effect of clinker substitution by a combination of calcined clays and limestone (which is the LC3 technology) allows reduction of up to 60% clinker to obtain cement with similar properties of ordinary Portland cement. The calcined clay used is of non-ceramic/refractory grade unfeasible for use by the conventional ceramic industries and thus does not have a resource conflict. With the current clinker production facilities, the amount of cement can be increased by a factor 2 – with only marginally increased investments. At the same time, LC3 is cheaper than ordinary Portland cement. The LC3 thus in fact is a low carbon cement and is a very attractive and feasible strategy to satisfy development and environmental objectives. Great piece on India’s growth and alternative technologies. The rapid economic growth provides more opportunities to create jobs in manufacturing. The possibilities are there; India just needs workers interested in the alternative technologies field.